Updating the first post here to keep different projects on track and sorted for new readers. Originally this thread was for just a couple products, but why clog up things with a lot of new threads. I'll just run one big one. Helps keep me on track better this way. New batch of designs just hit the bench and are either ready for some beta testers or will be very soon. The short version is that when I need beta testers for new products, I'll send out a call here. Eventually I'll get better at keeping track of all this but it can get chaotic at times. Do know that I skip around at times, not everything makes it to production, and sometimes it can take a while depending on how complex things are. I'm more of a manufacturing guy than a design guy, and this is a home business in addition to my regular job. I hope you guys find all this stuff entertaining, or at least useful. Even simple boards can be a pain so the more input I get the better. Will also give a bit of a window into the world of my design work. -In production and available now with Williams 6-7 digit code. Gottlieb System 3 Game Control Board A26 "tournament Board". -In production and available now. New manufacture volume pot makes a world of difference. Gameplan LDU-2/LDU-1 LED compatible replacement. -First few tests were promising, but having some issues with some circuits not working properly. Will diagnose further when I get a chance, but keep getting pulled in other directions. Gottlieb System 3 5v power supply. -Currently doing burn-in testing on my own machine. Found out I had the pinout wrong, so need a new revision. Gottlieb System 3 Solenoid Output Tester. - Boards are here, ready to assemble, will be doing initial testing soon. Yet Another Williams System 3-6 drop target attempt. -Using reed switches and magnets instead of the horseshoes. First batch worked but needed big dimensional changes. Have new layout ready for my next PCB order coming up. -First test batch is assembled, haven't started testing yet. If things work ok on the bench they should be ready soon. Damn, I was hoping for the Horseshoe eliminators. Wish I could, but that's Steve's design, not mine. I have an Agents 777 and my friend has a Sharpshooter and an Old Coney Island we could test it in if that helps. Hey, wait just a min. You did not even ask him if he had any tech experience. I have a blackout(6), black knight (7), and sorcerer (9) AND I'm local Also have 7 system 11 games if your bench display will eventually support them. Somebody told me he's on youtube or something, and you can always trust youtube. For everybody else, I'm keeping track and will make my decisions in the next couple days here. I've got a four Game Plans, and a bunch of system 3-7 games. I'd be happy to help. I don't have a game plan cocktail, but have access to one to run a test or two. I have a great many Williams 3-9 games I can test on. I don't have any GP games currently unfolded/accessible. Vid, you're also another guaranteed slot for a bench display. Always been a huge help in the past. Time to pick the first lucky(?) winner on the Gameplan. I'll do that tomorrow. Due to the cost I'm only doing one right now, with more if this one works. The bench display I need to program before I start testing. Assuming it works I can do up 4 of these for testers. Again, tomorrow. Time to wind down for the day. Whoops, wrong style programming header on the display tester, not able to easily upload the initial boot loader....... and they don’t like backwards power. Fried the first one. I have an Andromeda, Captain Hook and Old Coney Island set up and playing. Captain Hook is running with an Echo Lake board and the other two are original boards. I've been repairing my own games for over 10 years. I can help with the WMS 3-whatever. I have a lot of them come they the shop. I use your prior display test board but always wished for a complete set of displays. Of course, right after I posted this, Marco's sent me a big order. So I've been stuck working on that for a few days. Going to take another crack and the bench display this weekend. First reports coming back on the Gameplan board are sounding good, but a couple things to troubleshoot, so the test victim wasn't able to get a game ready in time for Expo. These are a bit more spendy, so I only had parts for one, going to build up another one next week. Figured out my problems, long list of minor changes to make for the next PCB version, but I did finally get one working properly. I'll be ordering more displays here shortly and will have 4 beta units to ship out hopefully by the end of the week. Will send PM's to folks when I have them ready to go. That’s going to be sweet. Nice work Hans. Once I sort out a quicker/easier way to get the bootloader and code into the board layout, I'll have to decide on either going after Bally/Stern or System 11 for the next code revision. Leaning very heavy toward Bally/Stern. Chris, make sure to PM me your mailing address for when I get these ready to mail. If it's not too late, I would love to get in on your WMS 3-7 bench display. We end up repairing a fair amount of 3-7 boards on the bench. We do a lot of 9-11Cs too. Both would be good, but there are probably more Bally/Stern than any other platform. I was thinking the same thing with the displays. Once I get the PCB sorted out I'll get in touch with my code guy. I really want to follow up quickly with the Bally/Stern code. But can't do that till I have a good board design. Ordering the next revision today. Lots of small changes that I found while trying to bootload these. The -021 version should be pretty darn close to production ready. Not quite confident enough that I'll be ordering a stencil yet though. Nice. Wish I could have done something like this myself when I was attempting it with the Universal Tester design, but cool to see someone getting around to it. Looks like hiring a coder was a good move. Makes it much quicker progress that way when it's not your native platform to be coding in but you have the general idea of what needs to be done to make something happen. I was struggling just with the Bally code in figuring out how to catch the display signals and knew there were probably better ways of doing it than watching generic inputs. PIC / microcontroller programming is something I've always had an interest in, but never seem to find the time to dig deep into. Good luck with the project, may have to order one up myself depending on how many systems will be covered. Gottlieb Sys80 / Sys1 would be neat as well.. though you may be limited in inputs with those and need to get crafty with parallel to serial type of thing. For me, a universal system 9/11 would be nice. There are so many system 11 variants that I would like to test with and it’s a hassle setting up displays. But I’ll take what I can get. Fresh updates from assembly session today on the bench displays. Turns out the OLED modules are even less standardized than I thought. Some of them have Vcc and Gnd reversed.... so I fried a pair of them today before identifying that problem. Good news is I have the programming much more streamlined now and the processor section looks to be nailed down. So looks like one more revision before being production ready. But I do have a pair of beta units that are ok and I can send out. Parts enroute for 3 more Gameplan boards, and a dozen bench displays with the revised layout. If assembly goes well, the bench displays are potentially ready for production. 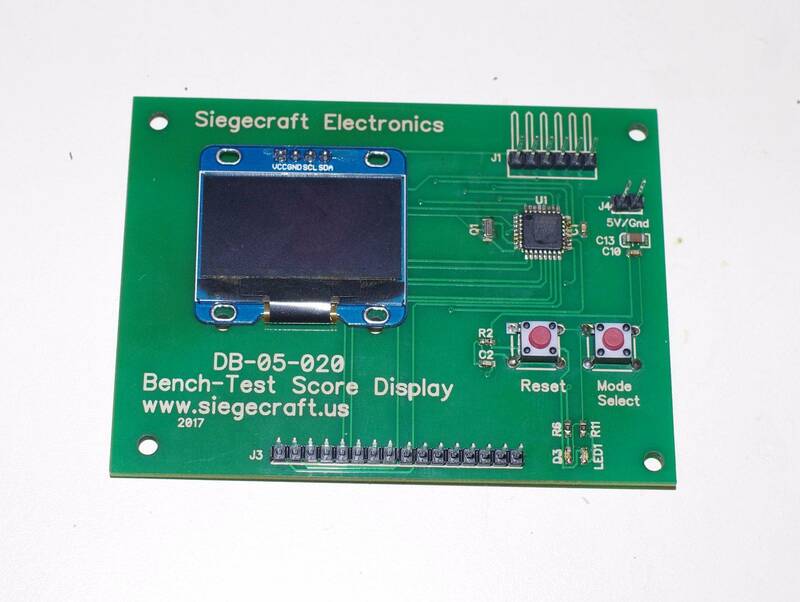 Ok. Current revision PCB on the bench displays looks good. A couple tweaks are still needed to make it easier to build but nothing that would have any effect from a customer standpoint. So I'm going to release the bench displays for low-rate initial production, I'll probably have 8-10 pieces from this first early run available to sell. This first few pieces won't have exactly the same layout/parts as the regular production pieces, so they'll be at a discounted price. I still need to work out instructions and harnesses, but I'll have that done by Monday, to start shipping out Tuesday. How do you add this to a cart, and will you take PP for it? Fixed. I forgot to click the 'active' button, should be able to put it in the cart now. Hans, how are code updates planned? Additional hardware needed for that? Probably going to need a new wire harness just because Bally used such a different architecture, but I brought all the I/O's out so it shouldn't need any changes to the PCB. I have 16 I/O's available on the main header, and another 4 on a 'just in case' header. I have a couple ideas on providing the updated code but it will need some kind of AVR programmer to burn the updates in. So I can either provide the code in a .hex format for people that have one and are able to load it, or I can re-burn it here via a mail-in service. With doing the updates here I'll probably only charge for return shipping. The only real complication I can see is logistics of getting the new code to somebody with a Bally machine. I currently don't have one. 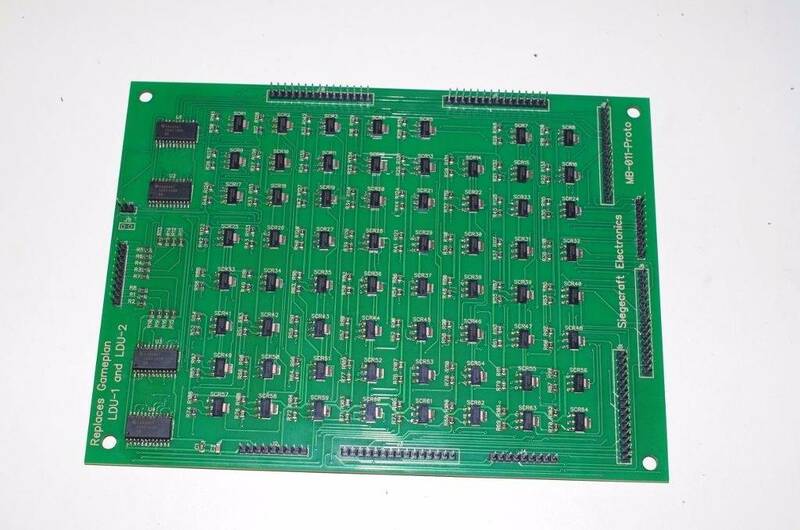 I ordered one of your test boards. I have an eight ball and an eight ball deluxe le. I'm somewhat of an electronics newb but I have a pocket programmer 3 eeprom burner (though I'm assuming this won't work for updating the code). I also have an AVR programmer i built for burning Wii mod chips. Not sure if that would work. I'd have to hunt it down and find a system I could use it on. Would also need to relearn how to use it. Might be simpler for me to find someone in my area with a programmer and some spare time. Well, this plan blew up in my face. You guys cleaned me out for the time being on the bench displays and I'm swamped with orders for all sorts of stuff now. I may have a few more available in a couple days, I'm still dialing in my process to reliably solder on the processor chip. Going to start going through them as quick as I can, and start get all the parts and pieces ordered for full production. Hey Hans any chance to support zaccaria? I've got a bunch of zac boards to troubleshoot/repair personally. I'll be honest, it's a bit down the priority list, but that possibility is there for sure. All depends on how things pan out for memory space and things like that. If you want some feedback, I tried it on a Sys6 and Sys7, and all was well. On two Sys9 boards, it did not work as expected. There were strobing numbers and "?" characters. Anyone else have an issue with Sys9? Well, shoot, I forgot that System 9's header were a different layout. Probably confusing the display with odd signals. So, you don't want strobe 1 (IJ1-9) for System 9? I had BCD connected to IJ3 and strobe to IJ1, and the results I saw were in my previous post. Pic of it connected, and a video of each, your old 7-digit LED display (P1 and status) and the new OLED display. The OLED is connected to the BCD data on 1J3, (the open 3 pins are for commas on P1, P2 And P3, P4 and /blanking) and display strobe 1 (pin 9 of 1J1). That is damn peculiar for sure. Not sure where my old header info came from, it was in my notes from a few years ago, and been a while since I've had a system 9 board here in person. You've definitely got it hooked up right. How are you powering the tester? If you don't have good ground continuity between them the inputs float and give all sorts of nonsense data. IIRC the analog ground for the sound portion of system 9 boards is somewhat isolated from the digital ground. It's powered by the alligator clips attached to a bypass capacitor on the same board. That system 9 issue has me perplexed. 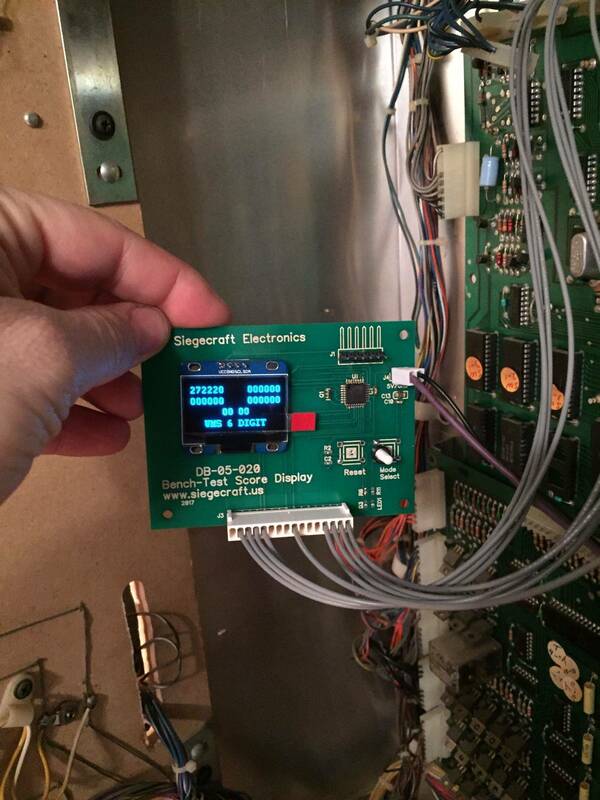 Any chance you've got a logic analyzer or oscilliscope? I know you probably don't, but I'd be interested to know the timing on strobe 1 and on your blanking line. Next batch is looking like right around thanksgiving availability. Bare boards are arriving today, just waiting on shipment info for the OLED's, and then I'll order the other parts too. I have a scope, but what does the blanking have to do with this? The blanking is a signal that is not even connected to this OLED display board. Plus, the blanking is either high or low, unless you want the signal that originates off of pin 4 on the display PIA, before it becomes the blanking signal. I've seen a couple instances of flaky capacitors connected to the 555/556 on the blanking signal, which caused it to have a sawtooth signal on the scope instead of a steady logic-high. First time I saw it was tracking down some very odd lamp matrix issues. A flaky blanking signal can cause the outputs on the PIA's to fall off about halfway through every cycle, enough to screw with the outputs but since it was still hitting a logic high intermittently the CPU was still running the code. Since the BCD signals that generates the digits comes from one of the CPU board PIA's, I'm curious if the PIA outputs are dropping out. Mainly though I do wonder if the strobe timing is different on system 9/11, and if I need to add a different mode to cover those. 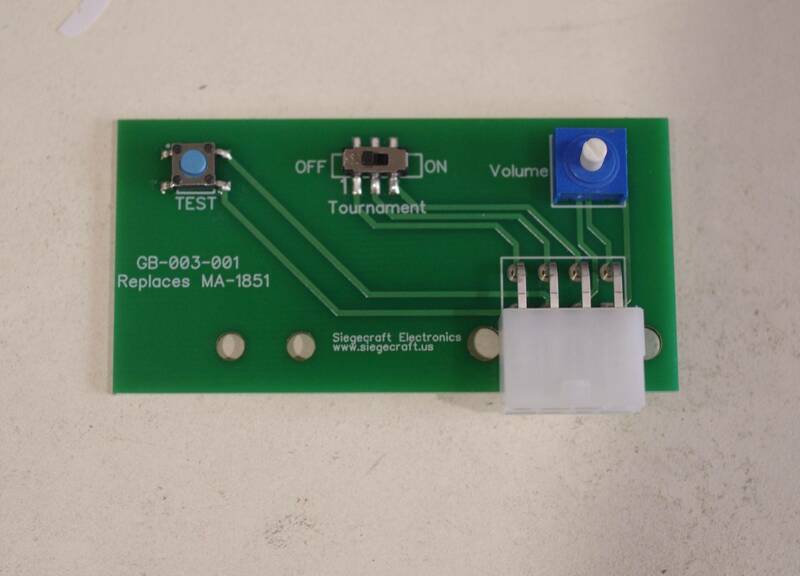 I see that the test board is only sensing one "strobe". Instead of using the other provided strobes, are you assuming timing in the software to acquire the other data? Yep. Only way to do it without moving up to a much more expensive processor and harness. Resets every time strobe 1 goes low, To prevent drift. That’s why I was wondering if timing may have changed with system 9.